1979 Cinzano Rose featuring Joan Collins, Leonard Rossiter, Omar Sharif & Gareth Hunt. Cinzano vermouths date back to 1757 and the Turin herbal shop of two brothers, Giovanni Giacomo and Carlo Stefano Cinzano, who created a new “vermouth rosso” (red vermouth) using “aromatic plants from the Italian Alps in a [still-secret] recipe combining 35 ingredients (including marjoram,thyme and [a species of Achillea called] musk yarrow)”. What became known as the “vermouth of Turin” proved popular with the bourgeoisie of Turin and, later, Casanova. The company was founded by brothers Clemens and August Brenninkmeijer in 1841 as a Dutch textile company, taking its company name from their initials, who were originally from the German Brenninkmeyer family that traded in linen and textiles since the 17th Century from their hometown in Mettingen, Germany. Since 2007, C&A has also ventured into high-street retail banking, creating C&A Bank GmbH in Germany, with its primary focus on providing consumer credit under its product “C&A Money”. 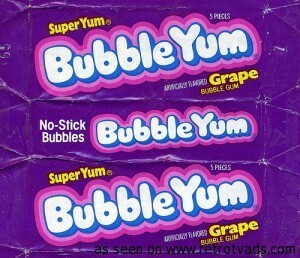 Bubble Yum is a brand of bubble gum marketed by The Hershey Company. Introduced in 1975 by LifeSavers, the bubble gum was the first soft bubble gum created. In 1977, rumors began to spread that the gum’s soft, chew-able secret was the addition of spider eggs. The Life Savers Company addressed the issue with an official full-page rebuttal printed in prominent U.S. newspapers (including the New York Times), to dispel the rumor and restore public confidence. Sales of the gum soon surpassed sales of Life Savers candy, and it became the most popular bubble gum brand. Nabisco bought Life Savers in 1981, and The Hershey Company acquired the brand in 2000. Bubble Yum’s official mascot is Floyd D. Duck, an anthropomorphic punk-style duck character. An advert from 1979 promoting British Milk. 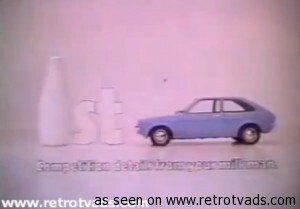 This particular advert is part of their car giveaway where they were giving a Vauxhall Chevette L.